Gathering and departure early in the morning for Delphi, with a stop for our coffee in the area of ​​Livadeia . 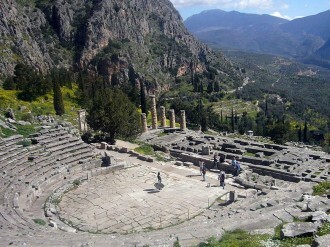 Then we will stop at Delphi, an area declared as a World Heritage Site by Unesco and considered the center of the earth, according to mythology. 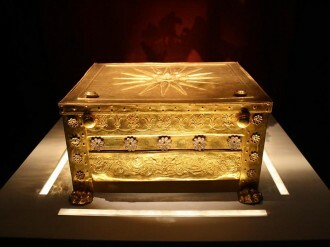 A guided tour to the Archaeological Site and the Museum will follow. Free time for lunch. Departure for Kalambaka and our hotel. Arrival, arrangement in the rooms. Dinner and overnight stay. After breakfast we depart for Meteora, where we will admire the rare geological phenomenon of a cluster of huge dark colored stones made of sand. We will visit monasteries and have time to tour. Our next stop is Metsovo, a traditional village built on the slopes of the largest mountain range in Greece, Pindos. Time for tour and free time for lunch. Then departure for Igoumenitsa, one of the largest ports in the country. Through which we will go to the island of Corfu. The Old Town of Corfu is located in a strategic position at the entrance of the Adriatic Sea, and has its roots in the 8th century BC. The three forts of the town, designed by renowned Venetian engineers, were used for four centuries to defend the maritime trading interests of the Republic of Venice against the Ottoman Empire. In the course of time, the forts were repaired and partly rebuilt several times, more recently under British rule in the 19th century. The mainly neoclassical housing stock of the Old Town is partly from the Venetian period, partly of later construction, notably the 19th century. Arrival to our hotel and arrangement in the rooms. Dinner and overnight stay. Departure after breakfast to visit the amazing Palace “Achilleion” with its spectacular view and beautiful decor built by Empress Elisabeth of Austria in the late 19th century, who was fascinated by the beauty of Corfu and the Greek mythology. We will enjoy a guided tour and then visit the picturesque Kanoni. Free time for photos and gifts. Our next stop is the town of Corfu for our lunch where we will wander through the beautiful small streets of the city. Return to our hotel. Dinner. Optional night out. Overnight stay. Breakfast and we start our tour to the island, passing through areas Kontokali – Dassia – Ipsos – Nisaki, through which we will arrive at Kassiopi, where we will have free time for our lunch and tour. Then we will depart for the most famous tourist resort of Corfu, Paleokastritsa. 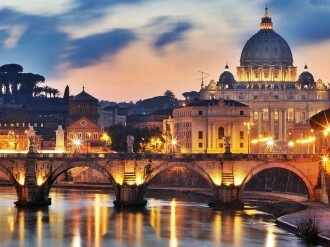 It is an area of ​​unique beauty, with magnificent sceneries. Endless olive groves, hills covered with pine trees, rocky coastline, coastline and coves with sandy beaches; all beauties of nature join forces and create a paradise on earth. Free time to wander an then back to Corfu. Dinner. Optional night out. Overnight stay. Breakfast and arrival at the port of Corfu. Boarding the ship for the port of Igoumenitsa. Depature for Dodoni, a settlement located near Ioannina. 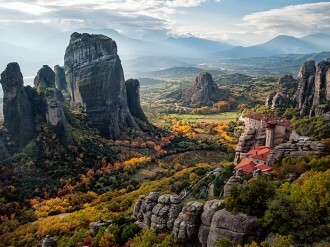 Ancient Dodoni is one of the most important Archaeological Sites in Greece, with its oracle being the cradle of Greek civilization, a major place of worshiping the king of the Gods, Zeus and also being the oldest Greek oracle. Time to tour. Then, we will move towards the city of Ioannina, which extends along the banks of Lake Pamvotis. The castle, historical sites, traditional houses, picturesque streets, workshops of folk art, silverware and woodwork are samples of its long history. Boarding the boat to visit the island of Kyra Frosini, a picturesque village with cobbled streets and stone houses with lovely gardens, which consists of about 100 families. Those of you who wish to, can visit the Museum of Ali Pasha. Then we will leave for our hotel in the city of Ioannina. Dinner and overnight stay. Breakfast and our first stop is the beautiful city of Konitsa, where we will have time for wandering around and have our coffee. Then depart for Aristi village of West Zagori at an altitude of 650 meters. Time to wander in the picturesque village. Departure for the traditional preserved settlement of Papingo, with its cobbled streets, the mansions, the beautiful fountains. Next to the impressive church of Agios Vasilios is the Primary School, work of Michael Anagnostopoulos, who in 1888 founded the famous Kallineia Schools, five in total, in Big and Small Papigo. Today, it houses the Library of Anagnostopoulos, who was the Director of the School for the Blind and Deaf Children of the Institute Perkins of Boston and contains rare works. Free time to wander around the beautiful village and for lunch. Departure for Ioannina. Free time in the city. Return to our hotel. Dinner and overnight stay. After breakfast we will visit the Greek History Museum also known as Museum of Wax Effigies. It’s the work of a single man, Paul Vrellis, who for 13 years worked only for this cause. The aim of the artist was to depict historical events from different regions of Greece, in natural size inside the museum. This way he could present the heroes and their role in their respective areas. 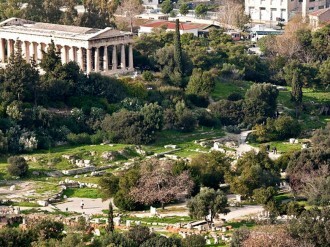 The museum houses about 150 wax figures and 36 historically themed significant events of Greek history. 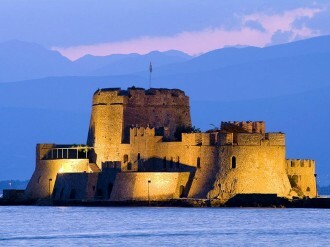 Then we will make a stop at Nafpaktos. Free time for our lunch in the beautiful city, which has been characterized as a traditional settlement. Nafpaktos is a city of long history since ancient times and is also known for the homonymous naval battle that took place in 1571. It said that it took its name from the words nays and pignymi, which means “full of ships”. Crossing the bridge of Rio – Antirio, also known as “Charilaos Trikoupis”, we will take our way back, with stopovers. Arrival late in the evening with the best memories.